Designed to protect hands from a wide range of chemicals, oils, and mechanical hazards, the Ansell Scorpio 19-026 Neoprene Double Insulating Gauntlets are ideal for providing hand protection during a multitude of tasks. They feature a special construction to permit intermittent contact with hot surfaces up to 180°C, and the double insulating liner further promotes comfort. The product code for the gauntlet gloves is: 19-026. When working in environments where harsh chemicals are present, it is paramount to ensure that the hands are sufficiently protected. 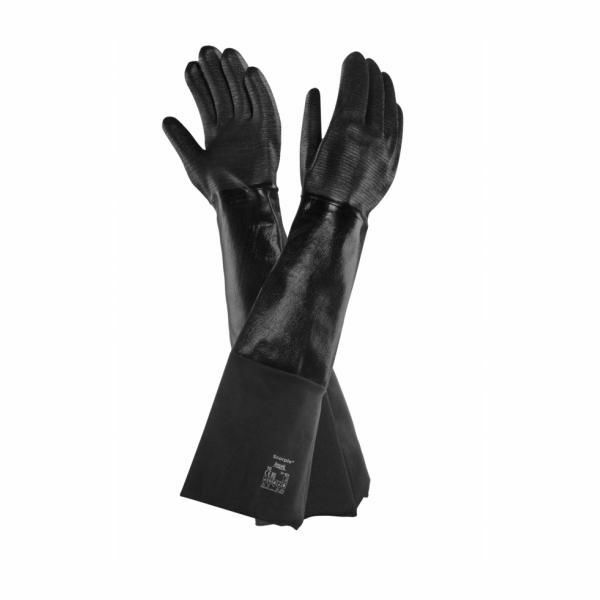 The Scorpio 19-026 Nitrile Gauntlets protect the hands and wrists from a range of oils, greases, and chemicals. With a cotton double insulating liner, the Scorpio 19-026 gloves are comfortable to wear while providing protection from intermittent contact with hot surfaces up to 180°C. This will help to keep hands protected from hot temperatures while allowing them to remain comfortable and reducing the risks of working with oils and greases. The table below showcases the test results of the Ansell Scorpio 19-026 gauntlets according to EN 388 Mechanical Risk specifications. The Ansell Scorpio 19-026 Gauntlets are available in a range of sizes to ensure a more comfortable fit for most individuals. Please consult the table below, then select your required size from the drop-down menu at the top of the page. The gauntlets have a length of 660mm.